DORAEMON MUSEUM! I have dreamed of coming to this museum ever since I knew it existed. I'm a super huge fan of Doraemon. I have been watching the anime ever since I was a kid and I just love love love this blue robot cat with a pocket full of magical gadgets. Visiting the museum was so nostalgic and surreal to me and I was soooo happy that I finally got to visit it that I could possibly cry in happiness! Although I was really saddened by the fact that it was raining all day when I visited the museum. Ugh, never would have expected that there would be soooo much rain during fall in Tokyo. Because of the rain I did not get to take as much pictures as I have anticipated to do due to the fact that it was gloomy and dark and not the best condition to take outdoor pictures. I'd LOVE to come back to visit the museum again during a bright and sunny day. Because this post will be a bit long and I have too many pictures so I will split it into two blog posts. This one will be on the museum and my next post will be on the gift shop at the museum and what I bought. Getting to the museum is actually pretty easy. You can take the Odakyu Odawara Line train from Shinjuku station to Noborito station. Once you get there you will be immediately greeted with this super cute Doraemon poster to ensure you are on your way to the museum! You can then board the special bus downstairs outside of the station which will take you directly to the museum. There are frequent buses and different ones each with a different character theme. Cute displays of merchandises in front of the museum. It was almost Halloween during the time when I visited so they had Halloween themed things on display. They also had the cutest direction signs ever! I love the small little details with the anime characters. The "what if" telephone booth. If you are a true Doraemon fan then you would know which movie this gadget is from. 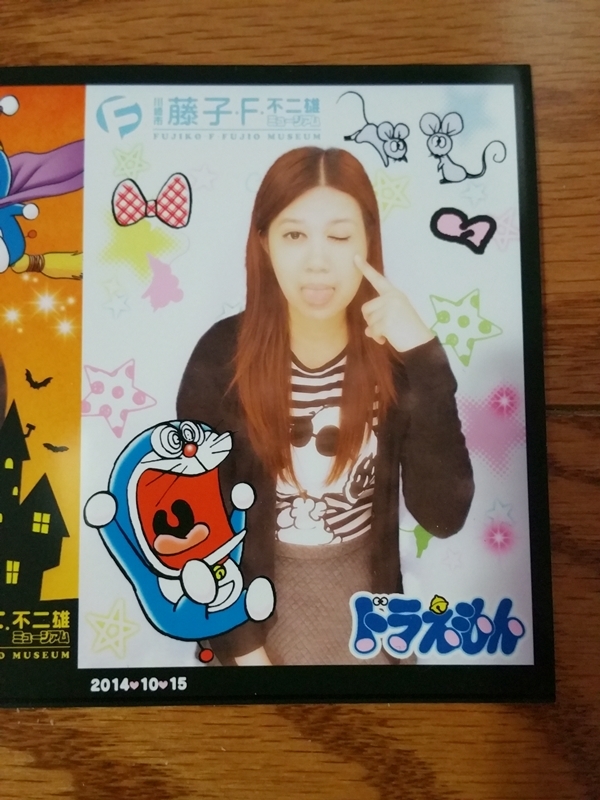 There is also a photo booth section with two photo machines where you can take Doraemon themed purikuras for only 400 yen. And here's a short video I recorded of one part of the museum, the most busy place at the people's plaza. It was so hard to take pictures in this area as there were so many children running around in it and I didn't want to include them in my pictures. There is a manga corner area where both adults and children can sit down and read some Doraemon comics and relax right next to Doraemon. I could literally spend hours here flipping through all the comic books. There is also a rooftop playground outside on the 3rd floor where I took soooo many pictures of the Doraemon statue. He is sooooo cute that I wanted to hug him and kiss him but it was raining so hard that day he was all wet and poor Doraemon getting rain poured on him all day. Right next to the rooftop playground is also where the museum cafe is located. There is a computer screen menu outside where you can choose your meal before you get seated. There are a number of different rooms that you can visit at the museum. Exhibition room where you are given a carry guide with different languages in English and Chinese where you can play and listen along while looking at the different artwork displayed as well as learning interesting trivia information about Doreamon and the writer Fujiko F. Fujio. You can also visit the theatre where you get to watch a short film of footage that is exclusive to the Doraemon museum. I had soooo much fun at the museum and I stayed there until it was almost time for closing. The museum is a such a happy and magical place for anyone who grew up watching the anime. It will make you feel so nostalgic, especially when I saw the timeline of all the Doraemon movies that have been released and I recall watching every single one of them. It reminded me so much of my childhood and I felt like I was a kid again. There are no pictures allowed in some areas of the museum and taking pictures is strictly not allowed in the exhibition room. Tickets to the museum also must be purchased in advance through a loppi machine found at any Lawson convenience stores in Japan. Each day there are 4 entrance time that is divided in a quarterly time schedule 1) 10am 2) 12pm 3) 2pm 4) 4pm. The museum opens from 10am-6pm. I'd highly recommend getting an early entrance ticket either at 10am or 12pm so that you will have enough time to fully enjoy and explore the museum. Admission fee for adults is only 1,000 yen ($10 CAD). You can also buy tickets outside of Japan through other ticket purchasing services such as through JTB and Bridge Japan. Tickets can also be bought through Voyagin. Check out their website for more travel booking and destinations.